Archival Pigment Prints, 9" x 12.5"
In the series, Honey Bees, the insects are stripped of their menacing association, and photographed in an empty space suggestive of a scientific illustration. Yet, rather than creating distance between the subject and viewer, the prints elicit a sympathetic engagement with the natural world from which we habitually disassociate ourselves. 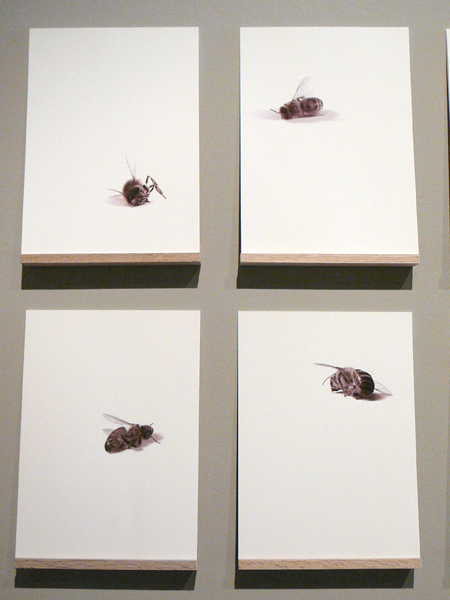 The postures of the bees draw attention to their individual attempts to turn away from the scrutiny of the viewer. They seem in weary rebellion against the imposition: turning away, prostrating themselves, or giving up. Installation view: (dis)-order, Delaware Center for Contemporary Art, Wilmington, DE. Archival Pigment Print, 9.5" x 9.5"
Preservation/Observation is a documentation of a bug specimen collection. The images are life-like depictions of the collection, often mistaken for the actual bugs. In fact, the specimens are slightly enlarged, drawing the viewer to look closer at details that ordinarily would go unnoticed. The spare quality of the prints is suggestive of a scientific diagram, yet the method of observation and collecting is decidedly unscientific, even careless. Scotch tape traps the dust and other detritus along with the bug part, suggesting a visceral, spontaneous, almost child-like approach to observation. The prints urge the viewer to identify both with the vulnerability of the bug, as well as with the urge to contain and control. Archival Pigment Prints, 12" x 12"
Iris prints, 14" x 14"
The group of nine digital prints in Under the Glass employs the spotlight of the sun through a magnifying glass to evoke a relationship between the experience of vulnerability, observation, and control. The insects in the prints are exposed in the spotlight and, as they are illuminated, become vulnerable to the scorching heat of the sun through the glass. The piece reflects the human fascination with looking, and the notion of examination as a tool of control and potential destruction. 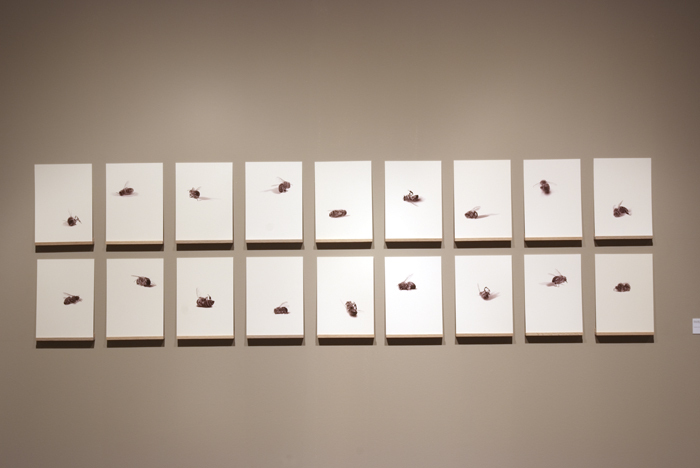 Installation view: Drawing from Life, Whitaker Center for Science and the Arts, Harrisburg, PA.